Over the weekend my husband was busy continuing with the renovations to our bedroom, therefore I had some time on my hands. I decided to do something crafty and this is what I came up with. I made this pattern for a felt birdie and started working on and sewing five of them. Here are some of the photos I took while I was making the felt birdies, and for those that would like to make their own felt birds here is the Felt Birdie Pattern. (Remember this is a PDF so make sure you have the reader to view it). All the directions to make these little birdies are in the download for the pattern, they are very easy and look ever so cute. Here is an example of how you could use them (and what I did). I’m over the moon with the end result even though I haven’t hung them permanently yet. 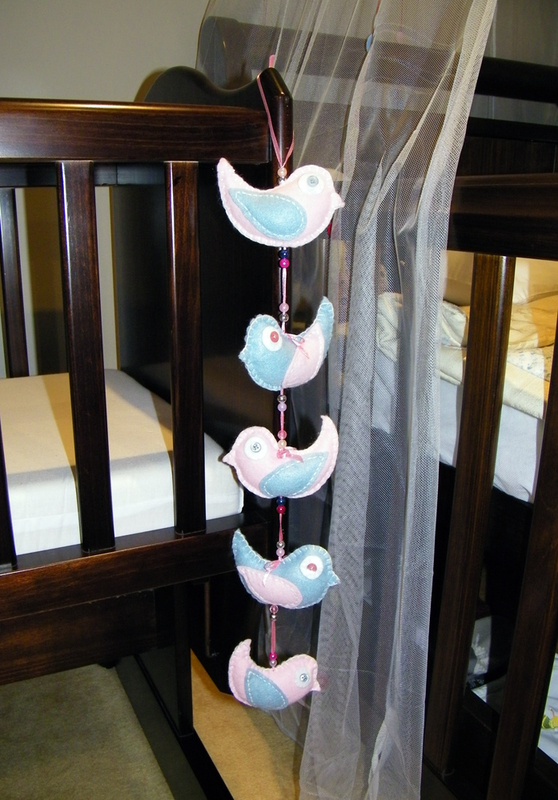 Remember you can use any colours you like for these felt birds, you can even use more than just two colours if you like. I kept with alternating the pink and blue, mainly because that is the felt that I had a lot of available to me and two of my favourite colours.